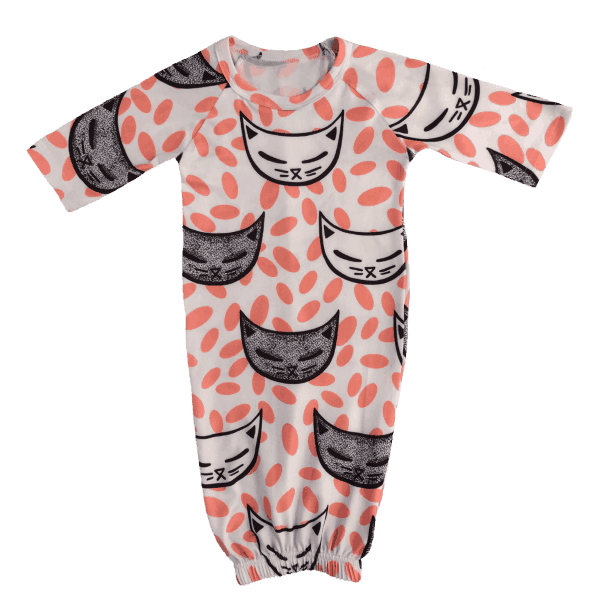 NEWBORN BABY GOWN IN CUTE KITTY ALLOVER PRINT FABRIC. AVAILABLE IN SIZES FROM NEWBORN THROUGH TO 6 MONTHS OF AGE. THIS NEWBORN BABY GOWN OFFERS CONVENIENCE FOR PARENTS AND COMFORT FOR BABY. CHANGING NAPPIES DURING THE NIGHT IS A WHOLE LOT EASIER, JUST PULL UP FOR QUICK ACCESS! MADE FROM A SOFT LIGHTWEIGHT FABRIC WITH CINCHED HEM TO COVER BABY’S TOES. AN ESSENTIAL ITEM TO KEEP BABY SAFE FROM LOOSE BLANKETS WHILE SLEEPING.